Imagine a summer breeze carrying the scent of freshly trimmed grass through the air. There’s a quiet buzz in the near distance. No fumes. No emissions. No disruptions to the peacefulness of the day. 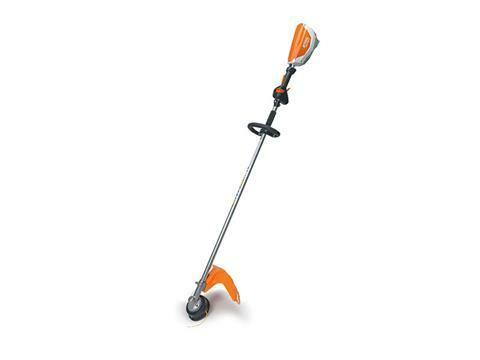 You’ve just witnessed the STIHL FSA 130 R AP Series battery-powered trimmer hard at work. Professional landscaping crews can now count on the same durability of its gasoline-powered counterpart in a battery-powered trimmer. The FSA 130 R’s quiet operation allows crews the flexibility of extended working hours during early mornings, evenings and beyond. With instant starts, a large 16.5” cutting width and a commercial-grade brushless electric motor for optimal performance and durability, the FSA 130 R is a powerhouse of convenience features. Plus, its variable speed throttle trigger offers three performance levels, allowing users versatility in selecting the best operation speed for the job at hand, conserving battery energy and allowing maximum run times. The external battery connection shifts the battery weight from the unit to the user’s back for a lightweight, well-balanced, fatigue-reducing trimmer. Whether you’re a professional operator of the FSA 130 R – or a passerby by happenstance – everyone will enjoy the benefits of the FSA 130 R battery-powered trimmer from STIHL.